A supplement to the LNWR Wagons books from Wild Swan Publications, covering rare and unusual wagons and trolleys. This publication complements LNWR Wagons Volumes 1 and 2 providing details of a number of more rare and unusual wagons including agricultural engine trolleys, propeller wagons, shunting wagons and chemical pan trolleys. 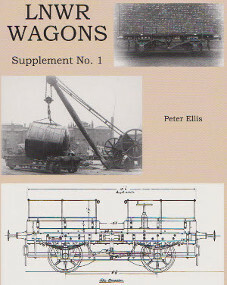 Information on the wagons covered, some of which were made in very small numbers, is very scarce and the author Peter Ellis has put considerable effort in obtaining and restoring the available drawings. These are not reproduced to any particular scale, but to sizes which ensure that they can be clearly read. The detailed drawings are complemented by the few rare photos that exist. This 60 page, card bound publication is an important one for the modeller of the LNWR, with twenty seven drawings, nine photographs and a detailed summary of the wagon types described.